But beyond the contempt shown for the international community, the deliberate sabotage of ozone monitoring again demonstrates two of the most prominent features of the Harper government: its disdain and even hostility towards science (and it own scientists) and its determination to promote the oil industry and protect it from any possible criticism. Tropospheric pollution is essentially pollution particles caused by combustion – industrial, automobile, forest fires, etc. – the kind of pollution that is the most dangerous to human health. The same day that the revelations about the Conseravtives’ cuts to pollution monitoring were published, an article in the New York Times reported on several new studies that revealed living in polluted air is even more hazardous to your health than previously thought. One study found that air breathed by most Americans (it’s hardly any different in Canadian cities) “…greatly accelerates declines in measures of memory and attention span.” A study in Boston concluded that the odds of having a stroke increased by 30% even on days when pollution was classified as moderate – a category that is supposed to suggest minimal danger to health. It went up to 60% for bad pollution days and the effects were almost immediate – within 12-14 hours. A study published in the American Journal of Medicine revealed an strong link between common pollutants – carbon monoxide, nitrogen dioxide, sulphur dioxide – “…raised a person’s immediate risk of suffering a heart attack..” increasing heart rates and thickening the blood, accelerating the development of atherosclerosis. Why would any government deliberately take steps that they know will make it more difficult to protect the health of its citizens? A health Canada report published in 2005 concluded that 6,000 people a year in Canada died as a direct result of air pollution and that the health costs of that pollution were a billion dollars a year. So clearly the Harper government isn’t concerned about Canadians dying or the strain on the Medicare budget. The Harper government’s priority is not the health of Canadians or the quality of the air we breathe and the water we drink. Its single-minded purpose seems to be to promote the oil industry and protect it from any criticism. 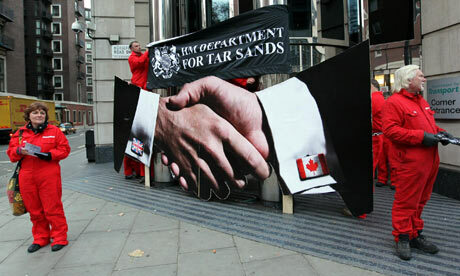 Demonizing critics of the tar sands as enemies of the country is just one small part of that goal. Eliminating scientific data that could link the oil industry to negative health effects is another. Why else would the government stop monitoring for pollution? If the message is giving you trouble, shoot the messengers. That’s exactly what Harper has done and will continue to do in his March budget. Last fall Environment Canada announced that some 700 scientists and researchers would be losing their jobs. Sixty were fired in January. This entry was posted in Climate Change, Tar Sands, Their Governments. Bookmark the permalink.